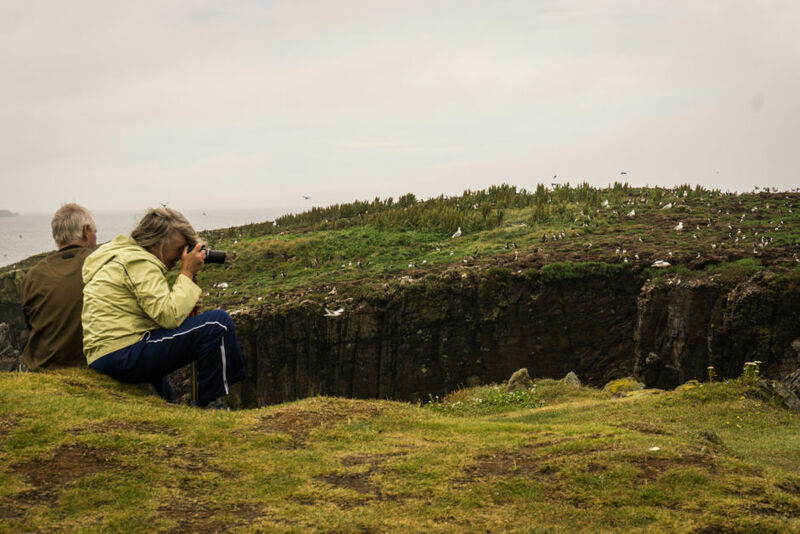 Watching puffins (aka sea parrots) in Newfoundland is something you really shouldn’t miss if you find yourself on this rocky east coast Canadian island. It’s a “quintessential” experience, if you will; it is, after all, the province’s official bird. They’re unmistakable with their orange and blue beaks and those expressive eyes that seem like they’re in a constant state of worry. In other words, they’re super adorable. The town of Elliston, on Newfoundland’s uber-scenic Bonavista Peninsula, is one of the top spots in North America to view puffins from land. These Atlantic Puffins are a sea bird that spend most of their time out on the ocean swimming and feeding. They can dive up to 200 feet to catch fish; their wings have adapted for this purpose, and help propel themselves underwater (check out this slow-mo video of this behaviour). Around 5 months a year — roughly from May to September — they nest to incubate and hatch their eggs (mating happens out at sea). Off of Elliston Point they burrow into the grassy cliffs of an offshore rock, a couple hundred pairs of them each year. And this is the perfect place to watch them. Renting a car or bringing your own from the mainland by ferry is the best way to explore Newfoundland. From the capital of St. John’s it’s just over a 3-hour drive to the north on the Bonavista Peninsula. Take the trans-Canada (#1) highway out of the city and stay on it for about 200 kms, then branch off to the 230 to reach the tip of the peninsula and eventually Elliston. From where you park it’s only about a 5-minute walk to the viewing area. It’s free, but you can leave donations — which are always appreciated — at a little shack near the parking area. There are very steep cliffs at the viewing area with no barrier. Always know where you are; the birds tend to be distracting. People have fallen here. Bring binoculars and/or a long telephoto lens. They don’t always fly over to the viewing area so you might only be watching them from a distance. Layer up; it can get windy and chilly on the point. Plan other stops on the way like the picturesque town of Trinity, and whale watching from Bonavista if you’re there at the right time of year. They can be seen right from the shore.